Key Difference: Christmas trees are usually evergreen conifers such as spruce, pine, fir and rarely cedar trees. Pines are conifer tress that belong to the Pinaceae family and Pinus genus. The picture of a perfect Christmas includes family, fireplace, tree and presents. Every year people search high and low to find that perfect Christmas tree for their family and for many people the early morning tread through tree farms has become a tradition. Although, originally Christmas is meant to celebrate the birth of Jesus Christ, for many the holiday means to celebrate with family and exchanging gifts. When one thinks of a Christmas tree they usually have a tree that is in pyramid shape with needle shaped leaves, so any tree that may resemble this shape is often regarded as a Christmas tree. 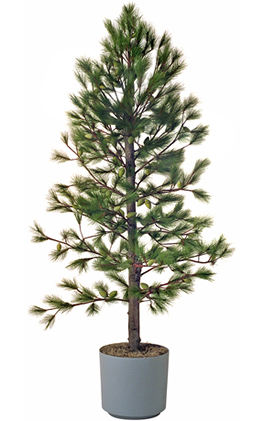 Christmas trees have many varieties, including one of which is pine tree. Let’s understand the differences between a Christmas tree and a pine tree. Christmas tree is usually the tree that is brought home and decorated with various different ornaments, lights, and sugary treats such as the candy cane and peppermint candy. The trees that are considered as Christmas trees are usually evergreen conifers such as spruce, pine, fir and rarely cedar trees. Christmas trees customs can be dated back to the 15th and 16th century in early modern Germany, where the original trees were decorated with fruits, nuts and other edibles. The top of the tree is often decorated with a star (to represent the Star of Bethlehem) or an angel (to represent the angel Gabriel). The tradition is depicted different in many other cultures, with some cultures celebrating oak trees, while others (Georgians) create their own trees from dried up hazelnut or walnut branches shavings. Some experts date the traditions back to pre-Christian winter rites, when Saint Boniface cut down the Oak tree that were worshipped by German pagans and replacing it with an evergreen tree, claiming that the triangle shape resembled the Trinity and the top of the triangle pointed directly to the heavens. However, the exact origins cannot be pinpointed to the tee. Popularization of the Christmas tree stemmed in the early 19th century, when Princess Henrietta of Nassau-Weilburg introduced the Christmas tree to Vienna in 1816. The traditions came to Britain when George III's German-born wife, Charlotte of Mecklenburg-Strelitz, introduced a Christmas tree at a party she gave for children in 1800, a party where Queen Victoria was present as a teenager. Following Victoria’s marriage to her German cousin, the tradition of decorating a whole tree rather than decorating a home with evergreens, became widespread. Pines are conifer tress that belong to the Pinaceae family and Pinus genus. They are the only genus in the subfamily Pinoideae. Depending on the region, there are over 200 classes or subspecies of pine, with only 175 names accepted by the Royal Botanic Gardens, Kew and Missouri Botanical Garden on their list. Pine plants can be found in almost all areas of the world, including temperate and subtropical regions of both hemispheres. Pines are evergreen trees that can range in various sizes including being as small as 3–80 meters tall or as tall as 79 meters. Most pine trees have barks that are thick and scaly, although branches many be thin. Pines are long-lived and can typically reach ages of 100-1,000 years, with some living even longer. The leaves of pine grow in four stages: Seed leaves, Juvenile leaves, scale leaves and finally needles. Pine needles are often bundled in clusters, with commonly 2-5 needles together, each fascicle produced from a small bud on a dwarf shoot in the axil of a scale leaf. Pines are monoecious, with the male and female cones growing on the same tree. However, some pine species grow only one type of cone. The male pine cones are usually smaller than the female pine cones. Now that we know that all Christmas trees don’t resemble each other, there is often an easy way to tell pines apart from fir and spruce. Although, they are all needled evergreens, they are quite different from each other. Pines can be distinguished by their bundled leaves. The needled leaves are often found in bundles of three to five together on a branch. Pines usually have fewer branches so it doesn’t seem as full or heavy as other trees. Fir trees have individual flat needled leaves that are attached to the stem. The needles grow in a spiral on the tip and lay flat, and this kind of display gives fir trees their full look. The trees are often bushy and look full. Spruce trees have single needles that are connected individually to the branches. These needles are flat but four-sided, which will roll between the fingers. Spruce needles are fragile and can break if they are bended. 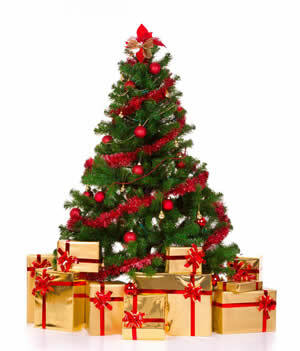 Christmas trees are usually evergreen conifers such as spruce, pine, fir and rarely cedar trees. Pines are conifer tress that belong to the Pinaceae family and Pinus genus.